Yippee-kiy-ay! 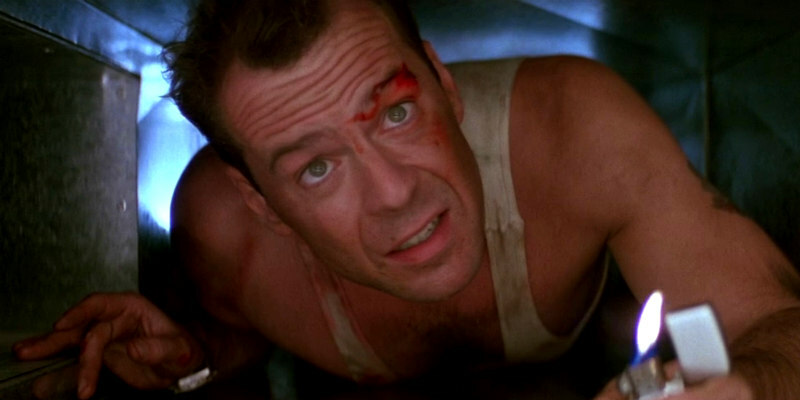 We take a look at the career of Bruce Willis. With a winning combination of movie star swagger, effortless charisma and a tongue planted firmly in his cheek, Bruce Willis has been entertaining audiences around the globe for over 30 years now. Whilst action is the first genre that springs to mind upon mentioning his name, Willis has frequently crossed genres, proving himself just as at home fronting comedies, dramas and thrillers as well. His latest film, Precious Cargo, sees Willis make a rare appearance as the villain of the piece, portraying murderous crime boss Eddie, the thorn in the side of our heroes (Mark-Paul Gosselaar, Claire Forlani). Precious Cargo lands in cinemas and on demand on July 15th, so what better time to look back at some of the great man’s finest moments? Before becoming the action star we all know and love, Willis scored his first lead role at ABC Television in the much-loved Moonlighting. The show also starred Cybill Shepherd as former model Maddie Hayes, with Willis portraying smart-alec detective David Addison. Crime of the week detective stories soon took a back seat to the will-they-won’t-they love match between Shepherd and Willis (even though they were widely rumoured to hate one another off set), with Willis even earning a Golden Globe and an Emmy during the show’s five year run. Quentin Tarantino’s second movie, and arguably even more loved than Reservoir Dogs, Pulp Fiction follows two mob hitmen, a boxer, a gangster’s wife and a pair of diner bandits as they intertwine in four tales of violence and redemption. Sure, Willis might only play a minor role as boxer-on-the-run Butch Coolidge, but his performance combined physical comedy and some fairly hefty dramatic chops, calling many critics to cite this as his comeback film after a run of less than successful ventures. In yet another critically acclaimed film, Willis’ portrays James Cole, a prisoner of the state in the year 2035, 30 years after a deadly virus wipes out 99% of the population. Cole is however able to earn parole if he agrees to travel back in time and thwart the plague. Due to the virus, the remainder of Earth’s population have to live underground because of the poisonous air. Wills gives a captivating and riveting performance, and demonstrates a wide range of emotions and versatility that critics and audience members had not seen from him before. An added bonus was Brad Pitt who gave a Golden Globe-winning performance as Jeffery Goines. The film that brought us one of the most memorable lines in cinema (“I see dead people”) also saw action hero Willis deviate from type and dip his toe, very successfully, into the realms of supernatural horror. He stars as Dr Malcolm Crowe, a child psychologist attempting to cure a young boy (Haley Joel-Osment) who claims to be able to communicate with spirits who are unaware that they’re dead. Willis shocked his critics in portraying Crowe, delivering a sensitive and haunted performance that helped The Sixth Sense become 1999’s second highest grossing film whilst also attracting six Academy Award nominations. Based on the acclaimed comic series by Frank Miller, Sin City comes to life in a live-action feature from director Robert Rodriguez. The stylised crime noir interweaves multiple storylines from the series’ history as it explores the den of iniquity and misery that is Basin City. With so many standout performances, fans were hard-pressed to settle on a favourite moment, but Willis’s portrayal of John Hartigan, a noble man prepared to stop at nothing to defend the woman he loves, drew widespread admiration from all who saw the film. Willis takes the lead role alongside Joseph Gordon-Levitt in this critically lauded, mind-bending sci-fi crime thriller. Set in a future where time travel exists but is only used as a form of execution, Looper follows our hero, Joe (Willis), who learns that the mob want to close his particular loop by sending him 30 years back in time where his former self will kill him. Sure, critics derided the prosthetics used to make Levitt look like Willis, but the premise, performances and a killer twist all mark this out as one of Willis’ finest hours. This action-packed comedy delivers a star studded cast, with Willis leading the pack as Frank, a retired CIA agent whose building comes under attack by assailants. In order to save himself and the people around him he recruits his now retired ex-colleagues to help him. Even alongside award-winning cast members Helen Mirren, Morgan Freeman and John Malkovich, Willis stands out thanks to some trademark wise-cracking humour and a typically charismatic performance. The conceit even led to a winning sequel (imaginatively titled RED 2) that threw even more heavyweights into the mix in the form of Sir Anthony Hopkins. Willis gets his snarl on in this glossy action thriller, convincingly playing against type as a decidedly unhinged crime boss hunting down a seductive thief (Claire Forlani – Meet Joe Black, TV’s CSI: New York) after a botched heist. The film also features Mark-Paul Gosselaar, former star of the iconic kids TV show Saved By The Bell, here playing a decidedly ripped fellow thief caught in the web of deceit and lies being spun around him, so whether you’re in it for the eye candy or the grizzled charm of Willis playing evil, Precious Cargo is a gloriously high octane way of kicking off your summer in style! Precious Cargo arrives in cinemas and on demand from July 15th, 2016, courtesy of Signature Entertainment.